If you're interested in starting a horse-boarding business, you'll first need to have extensive experience working with horses, or be willing to hire people that have the requisite experience. Having an experienced barn manager on staff is key for most boarding operations. The ideal horse boarding operator has a good reputation and background working with horses, trainers and owners. If the boarding location you pick doesn't already have proper facilities and equipment on site, you must be willing to add these items as needed. Boarding operations need to have at least one barn with stalls, safely fenced paddocks and fields, mowing equipment, a tractor, water troughs, a riding arena or trails, tack rooms and areas to store feed and bedding. A boarding stable must be in compliance with state and local regulations, such as maintaining a business license and operating in accord with the zoning regulations that apply to the specific piece of property. It's your responsibility as the owner/proprietor to research all the regulations and licensing requirements prior to opening your stable. 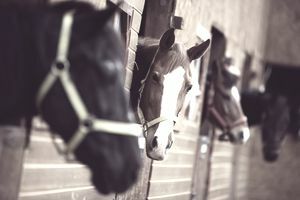 Boarding stable owners should consider securing a liability insurance policy to protect against lawsuits that might result from any injuries occurring on the property. Most banks will require proof of such a policy before they'll lend any money toward the purchase or rehabilitation of any horse boarding facility. Boarding stables usually offer some combination of full board, partial board, or pasture board services to clients. The full board usually includes a stall, turnout and all daily care such as feedings and stall cleaning. The partial board usually includes a stall, but the horse owner is responsible for daily care such as stall cleaning and turnout. Pasture board does not include a stall, but the horse is kept in a field that often has some sort of shelter access such as a run-in shed. What types of board you offer will determine your staffing needs. Full-service boarding facilities require additional staff such as grooms and barn managers. Pasture board operations can get by with fewer staff members. Some boarding facilities specialize in catering to one particular discipline, such as English riding or Western riding, while others seek boarders from all backgrounds. Some facilities also choose to offer specialty care for stallions or horses in training. It is important for the owner of a boarding facility to develop a relationship with a local farrier and equine veterinarian. These relationships are often mutually beneficial, as your farrier or vet may refer more clients to you down the road. It is also critical that you find good, reliable suppliers for quality hay, bedding, and grain. It may also be wise to develop an agreement with a riding instructor to offer lessons at your facility. This can increase overall interest in your facility and bring in a trainer’s established clientele to your location. Many boarders expect to have access to an instructor and riding arena. It is also critical that you price your facility’s services competitively. This will involve a bit of local market research, which you can easily accomplish via phone calls or the internet. You want to offer a good mid-range price, perhaps with some sort of initial discount or other incentives to get your first boarders in the door. It is also wise to develop a boarding contract outlining all services that will be provided and the type of board being established for their particular horse. This should be signed by the client at the beginning of the boarding relationship. You may also wish to outline additional services that may be available and the costs for those extra options. In addition to the standard advertising online and in local print publications, try to advertise your boarding operation at local equine businesses such as tack shops, feed stores and show grounds. Large horse shows or other equine events often print up programs with local advertisers, and this is another great way to gain exposure. Over time, your best form of advertising will be referrals from satisfied clients. One happy customer can recommend you to dozens of friends and acquaintances in the equine industry.